the 2007 Grammys on one CD. "Put Your Records On" by Corinne Bailey Rae. "You're Beautiful" (James Blunt), James Blunt, Amanda Ghost & Sacha Skarbek, songwriters . "Black Horse And The Cherry Tree" - KT Tunstall. "Bad Day" - Daniel Powter. "Stickwitu" - The Pussycat Dolls. "Hips Don't Lie" - Shakira & Wyclef Jean. "Lookin' For A Leader" - Neil Young. "The Saints Are Coming" - U2 & Green Day. "When You Were Young" - (The Killers) Brandon Flowers, Dave Keuning, Mark Stoermer & Ronnie Vannucci, songwriters. "Living With War" - Neil Young. "I Am Not My Hair" - India.Arie . "Got You Home" - Luther Vandross. "Beautiful, Loved And Blessed" - Prince& Tmar. "I Am Not My Hair" - (India.Arie) Drew Ramsey, Shannon Sanders & India Arie Simpson, songwriters. "Coming Home" - Lionel Richie. "In My Own Words" - Ne-Yo . "Don't Feel Right" - The Roots. "What You Know" - (T.I.) A. Davis & Clifford Harris, songwriters; (Donny Hathaway, Leroy Hutson & Curtis Mayfield). "I Don't Feel Like Loving You Today" - Gretchen Wilson. "Once In A Lifetime" - Keith Urban. "Leave The Pieces" - The Wreckers. "What Hurts The Most" - (Rascal Flatts) .Steve Robson & Jeffrey Steele, songwriters. "Your Man" - Josh Turner. from the Staples Center in Los Angeles, on Feb. 11, 2007. 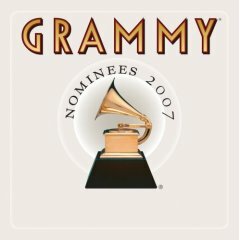 This list contains selected major nominations, for a complete list, go to http://www.grammy.com.